Marriage can be one of the greatest and most joyous decisions of life. Persons desiring to be married at Christ Church must be active members (or children of members), in the membership process, participating in the current Alpha Course, or staff/summer staff alumni. For information on scheduling a wedding, please contact Cindy Purifoy at cindy.purifoy@gmail.com or 913.648.2271 x246. Each couple married at CCA is assigned a Wedding Coordinator who will be available to help manage details and provide all the support you will need as you plan your wedding ceremony. Our Wedding Packet contains detailed wedding policy and pricing information. 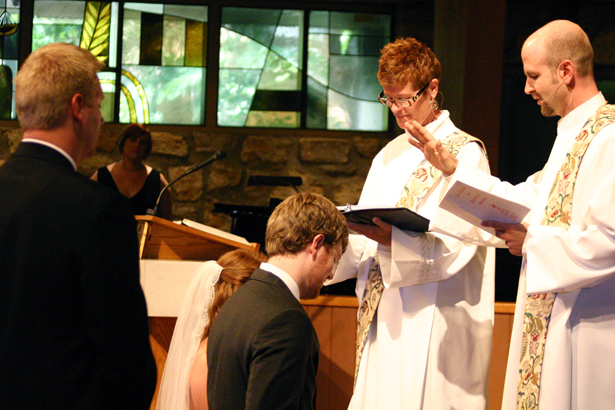 The ceremony itself is taken directly from the Book of Common Prayer. We also have important information available for those who have been married in a civil ceremony and are are interested in the Blessing of a Civil Marriage.